As we make our way into fall, I want to share a fun seasonal activity that I created with the help of some large scale props, a little bit of craftiness and a few colorful chords. Many of the apple-themed activities that I have come across in my research are cute and catchy, but most are geared toward young children and emphasize academic skills such as counting and color identification. I have noticed that for groups in which clients’ ages and levels of functioning of clients vary greatly, targeting specific academic concepts may not often be the most beneficial therapeutic approach. I found that many of the most successful activities in this particular situation often emphasize broad cognitive, social and emotional areas such as decision-making, attention-to-task, impulse control and following directions. For this activity, you’ll need to make a medium to large-sized tree as your main supplemental! 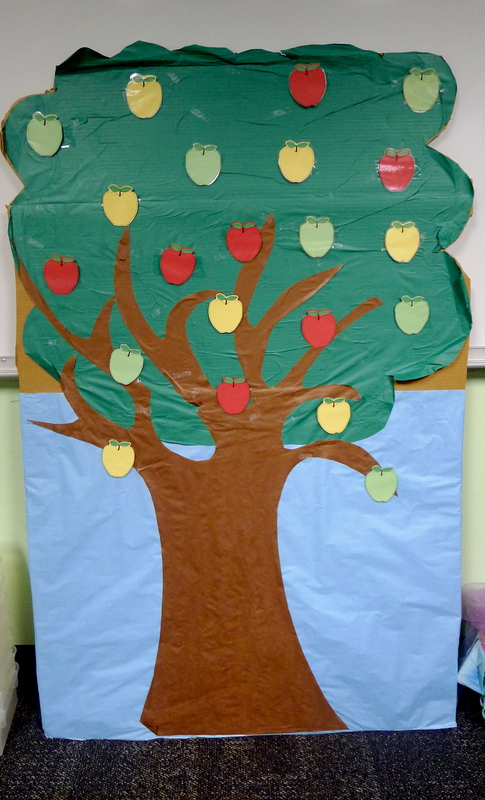 I was lucky enough to recycle a leftover tree prop to make my apple tree, but a piece of poster board could work well for most groups. Draw or print enough apples for your group—I made sure there were at least three apples per person, plus a few extras in case some get damaged or lost—and adhere them to your tree with velcro. If possible, laminate your apples for extra durability. 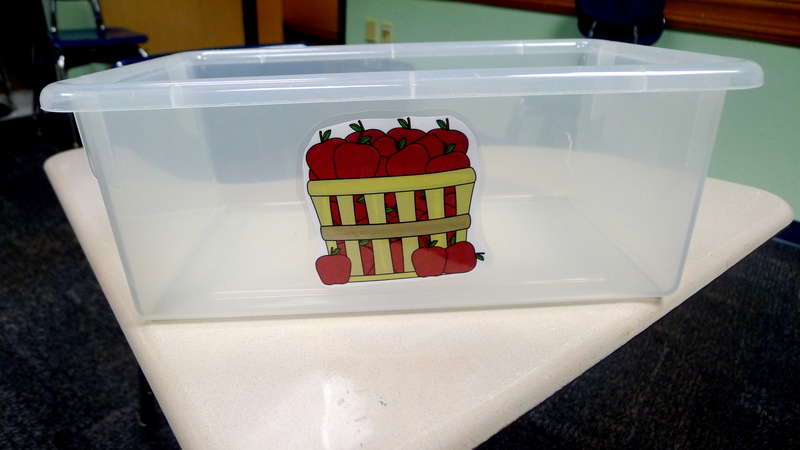 For clients with autism who struggle with abstract thinking, I recommend making some sort of apple basket (either one large one for the group or individual baskets) in order to make the task more concrete. You’ll notice that my “apple baskets” are clear bins with a picture of a basket filled with apples on the front and inside. Below you’ll find a brief recording of my song, “Apples in a Tree,” and a copy of the chord sheet. When I implement this activity, I instruct clients to sit and listen to the chorus, which contains the instructions, as I sing it through one time. Clients must then raise their hands during the “Who’s it gonna be?” verse if they would like to come pick an apple. This is repeated until every client has appropriately raised their hand and had an opportunity to come up to the apple tree. The overall song structure is very loose, as I often repeat the chorus and improvise lyrics over the melody as needed to prompt each client as they select an apple. After the final client has had a turn, I sing the last two lines that you’ll hear on the recording and have everyone hold up their apples. I hope you’re able to implement this activity with your own clients. I’d love to hear about the adaptations that you make! ← It’s A Beautiful Day for Music at Songs For Success!